Amazon.com description: Product Description: For thousands of years before the beginning of recorded history -- the legends tell us -- a powerful civilization flourished in the middle of the Atlantic Ocean. This breathtakingly advanced island continent boasted splendid cities, golden temples, crowded seaports from which the far-reaching influence of Atlantis spread to the rest of the world, until its destruction in an overwhelming cataclysm. Now, based on careful study of scientific undersea research, Charles Berlitz proves that Atlantis is not legend but fact -- and unravels a mystery even more startling than the Bermuda Triangle! What message lies buried with the mighty stone structures deep beneath the Atlantic? What profound revelations about Atlantis have come to us from beyond the Earth? 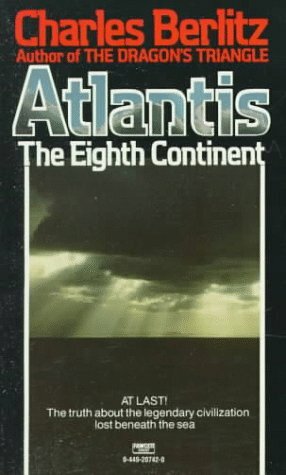 Was Atlantis destroyed in an ancient nuclear war? What great centers of Atlantean culture yet await discovery? About: Draws on extensive archaeological and scientific sources to discuss evidence for the existence of the lost continent of Atlantis. About: For thousands of years before the beginning of recorded history -- the legends tell us -- a powerful civilization flourished in the middle of the Atlantic Ocean.